The importance of rivers in the Ancient world cannot be overstated. To the city-states of antiquity, usually sited on the banks of major rivers, they provided first of all a source of fresh water. They also provided rich alluvial plains to grow crops, and to irrigate those crops. As these city-states grew into empires, rivers provided a swift highway joining the coast to the hinterland. They connected larger cities to the sea, and thus opened up trade routes. For the larger empires they provided a permanent boundary, a natural partition between empires, or between an empire and the wilds beyond. It was natural, therefore, that the ancients accorded rivers with respect. They animated and personified these rivers with spirits, and these spirits evolved into gods, and were given temples, shrines and sacrifices. The depiction of gods was commonplace on the reverse of Greek coins, and by about 300BC river gods also appeared on these reverses. River gods, however did not appear on Roman coins until the first century AD. Domitian first depicted the river Rhine at his feet to celebrate his crossing of that river and subjugation of the tribes beyond. 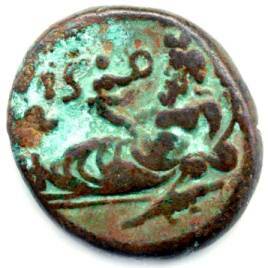 This article looks at those coins minted in Imperial Rome depicting a River God as the main character, and in most cases the Romans used the last depiction: as a figure reclining in water. The first emperor who depicted a river god as the main character on the reverse of a Roman coin was Trajan (98-117AD). Trajan used the Danuvius, as the Romans called the Danube, extensively on his coinage. The first coin was a large brass sestertius (Sear 3197) depicting the Danube as a man with cloak billowing, holding the province of Dacia, depicted by a reclining woman, by the throat. This aggressive piece symbolises the importance of the Danube to Trajan, and its association with war and conquest. Previously, the Danube had been the northern boundary, the limit of the empire. Trajan was the first (and only) emperor to cross that river and permanently conquer the country beyond. As a frontier the Danube was associated with the military, its extension symbolised Trajan’s expansionist reign. Trajan further depicted this river on a silver denarius (Sear 3138), this time as the sole feature, a man reclining with billowing cloak with the word DANVVIVS in the exergue. What the Danube symbolised suited Trajan’s reign quite nicely as he was the first emperor since Claudius to significantly extend the boundary of the empire. His first conquest was Dacia, the land beyond the Danube, which he invaded twice before subduing. The succeeding emperor, however, was quite different. He chose quite a different river as a standard for his reign. That Emperor was Hadrian (117-138 AD), and the river was the Nilus (Nile). Hadrian’s attention was internal, to the peace and stability of the empire, and he renounced most of his predecessor’s conquests (but not Dacia). Hadrian concentrated on the welfare of the provinces, and made at least two famous tours covering most of the provinces of the empire. What better river to symbolise this than the Nile? If the Danube symbolised war and conquest, the Nile surely stood for peace, prosperity and the provinces. The Nile was the lifeblood of Egypt, arguably Romans’ most important province, it flooded annually to replenish the surrounding lands with fresh nutrients, it provided irrigation, and it acted as an important highway for trade to the lands of Nubia beyond the empire. Hadrian flaunted the Nile’s prosperity throughout his coinage in all metals; the gold aureus (Sear 3427), the silver denarius (Sear 3508) and the bronze sestertius (Sear 3613). The Nile is depicted reclining, with an arm resting casually over a rock, holding a reed and cornucopiae (the horn of plenty, reminding all of the prosperity that the river brought), often with two children at play, as well as a hippopotamus and a crocodile. Sadly this was the very river that claimed the life of his friend and lover, Antinous, who drowned when the imperial party took a barge upon the river in 130 AD. The next two emperors, Antoninus Pius (138-161AD) and Marcus Aurelius (161-180AD), were cast in a similar mould to Hadrian, governing in the interests of peace and prosperity. The attention of Antoninus Pius was not on the provinces, but back on Rome and Italy. He tried to rectify the imbalance, as he saw, in his predecessor's reign, by reminding everyone of the city that ruled the empire, and its heartland. Marcus Aurelius shared this philosophy, but threats on the eastern and northern frontiers drew him into war. 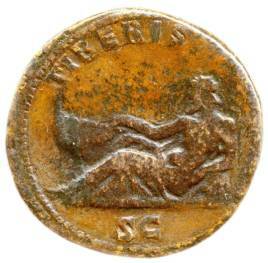 It is no surprise then that the only river they depict on their coinage is that of the Tiber. The Tiber flowed through the city of Rome and was the foremost river in Italy proper (the lands of the Po to the north were usually seen as part of Gaul). Both emperors produced bronze coinage depicting this river as a man reclining, with his right arm resting over a boat, and the left over an overturned urn or vase flowing with water. Antoninus Pius produced the large brass sestertius (Sear 4237), clearly stamped TIBERIS, and Marcus Aurelius produced the smaller copper As (Sear 5605). Although the river was not named on the As, it was depicted in exactly the same manner. After the reign of the Antonines, the empire’s fortunes turned downwards, and the succeeding emperors spent more time, energy and money investing in the military situation. They were desperate times, and the reverses of coins were required increasingly for propaganda rather than beautiful scenes and cunning art. Mars, Jupiter and depictions of standards proclaiming the loyalty of the legions replaced gods of rivers and other peaceful deities. There are two exceptions in the later empire however: the Rhine coin of Postumus and the Euphrates coins of Hanniballianus. Postumus was the first ruler of the breakaway Gallic Empire that had separated from Rome in the reign of Gallienus (259AD) and included Gaul, Britain and, for a time, Spain. In these times barbarians were pressing hard against the frontiers of the empire, and the defence of the Rhine border was a major concern of these Gallo-Roman emperors. 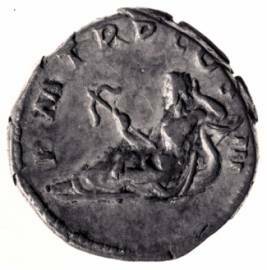 Postumus (259-268 AD) produced an antoninianus  (Sear 3130) depicting a River God as a man reclining with his forearm resting on a boat, with the inscription SALVS PROVINCIARVM (“the health of the provinces”). 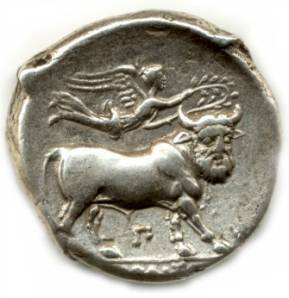 This god is sometimes depicted with horns on his head, although horned river gods sometimes appear on earlier Greek coins as well. We can only assume this river god is the Rhine itself because, although it was not named, it was the only significant river within the borders of the Gallic Empire, and important enough to the safety of this empire to warrant being portrayed on a coin. River gods then virtually disappear from Roman Coins for almost a hundred years. 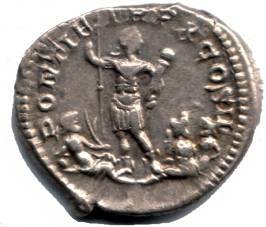 The only exception is an antoninianus of Probus (276-282AD), dedicated to the mint town of Siscia, depicting a personification of that city seated between two river gods holding a diadem, with the legend SISCIA PROBI AVG (Sear 3369). One of these rivers would probably be the modern Save (Savus to the Romans) and the other the Kupa; as the modern town of Sisak, in Croatia, lies between these two. Then, in the reign of Constantine a series of coins depicting the Euphrates appear. They were minted in the name of Hanniballianus, Constantine’s nephew, who was given command of the territories around Pontus and those bordering the Euphrates. Hanniballianus was entitled the King (Rex) of Pontus from 335 AD until Constantine’s sons murdered him on their father’s death in 337 AD. The Euphrates was depicted on a small silver coin (called a siliqua, Sear 3934) and a small bronze coin (Sear 3935). The Euphrates was shown as man reclining holding either a fish and rudder, or a sceptre. The Euphrates was previously depicted on coins of Trajan and Caracalla (see below), together with the Tigris, at the feet of the aforementioned emperors, announcing victories over the Parthians whose heartlands lay between these rivers. However the coins of Hannibalianus were the first to depict this river solely. As noted above, unless stamped with their name, the attribution of River Gods to the rivers they represent is not an exact science. There are two more coins, a gold aureus of Hadrian and a silver denarius of Septimius Severus (196-211 AD), that depict unnamed river gods that have been tentatively attributed to the Tyne river in the north of England, known by the Romans as the Tinea. Hadrian’s aureus (Sear 3410) has no inscription and depicts a river god as man reclining to the left, holding a rudder over his shoulder, and resting against an inverted urn. This coin was minted around the time of Hadrian’s first provincial tour, which included the north of England where he planned the construction of Hadrian’s Wall. The eastern end of this wall runs parallel with the Tyne. Hence many scholars believe this to the Tyne, though there are also arguments for the Tiber. 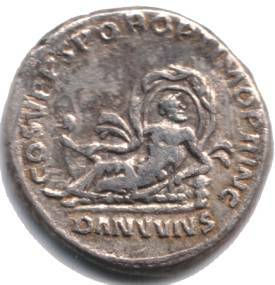 Septimius Severus’ silver denarius (Sear 6347) depicts the river god as a man reclining to the right, holding a large sea shell and a rudder, with right arm resting upon an urn from which water flows and a seahorse at his feet. Again this coin has no inscription, and no other clues as to the river he represents. Many scholars believe this to be a depiction of Oceanus, because of the seahorse and seashell. But once again others believe that it could be the Tyne, as it had an important sea fort at its mouth that Septimius Severus used as a base for his invasions into Scotland. There is also a reverse of a denarius of Caracalla, depicting Caracalla standing between two river gods and the personification of a province. Some interpret the province as Britannia with the Tyne and Eden rivers (the rivers that flow parallel with Hadrian’s Wall). Others believe it to be the province of Armenia or Mesopotamia between the Tigris and Euphrates rivers. There are two other coins that, though not strictly speaking River gods, should also be mentioned as they are aquatic gods and depicted in a similar manner to that of river gods. The first is a large brass sestertius of Trajan that depicts the Genius of the “Aqua Traiana”, an aqueduct built by Trajan in Rome, reclining to the left within an arched shrine, holding a reed and with rocks below. The inscription in the exergue reads “AQVA TRAIANA”. The second is a silver denarius (Sear 3518) of Hadrian that shows Oceanus, the god of the Ocean, reclining like a river god with his arm resting over a dolphin and holding an anchor. Although this deity is not named, its choice of attributes points clearly to Oceanus. Oceanus was a powerful deity of the sea in ancient mythology, the son of Terra and father to all the rivers, hence his depiction on this coin as a river god. 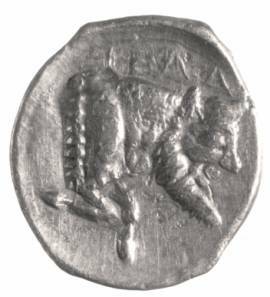 Although not technically Roman Imperial Coinage, there were a lot of coins that were minted in the provinces by semi-independent city-states and regions. There is varied amount of reverses on these depicting local river gods. Some of these river gods are named, others guessed at because of the proximity of a river to the city in which it was minted. Roman Provincial coins, arguably, are cheaper and sometimes not as well defined as those minted by official imperial mints. They are definitely more varied as literally hundreds of different city-states across the empire minted their own local coinage, with their own iconography, denominations and legends (in Greek generally for the Eastern provinces, and in Latin for the Western). The local Nilus reverse on Alexandrian tetradrachms is one of the most common Roman Provincial reverses of a river god. As we can see, the Adoptive & Antonine Emperors (Trajan, Hadrian, Antonius Pius and Marcus Aurelius) continuously used River Gods on their coinage. The rivers they chose to use, however, were different – each river conveyed a slightly different message, the image that the emperor liked to have associated with his reign. Other rivers were used by other emperors, but more sporadically and the practice did not finish until after the reign of Constantine. To the collector, river gods offer a small series of quality coins where the artisans that designed and minted coins, particularly the period from Trajan to Marcus Aurelius, really used their skills to produce some beautiful work. To a beginning collector, however, these coins may be out of their price range and the river gods on Greek and Provincial coins sometimes offer a cheaper start to collecting these reverses. NOTE: All Sear references in this article can be found in David Sear’s Roman Coins and Their Values Vol II (Spink 2002). Except for the Postumus, Probus and Hannibalianus coins, who require an earlier edition of Roman Coins And Their Values (4th Edition 1988), also by David Sear. Foss, Clive. Roman Historical Coins, Sanford J Durst, 1990. Jones, John Melville. A Dictionary of Ancient Roman Coins, Seaby, 1990. Mattingly, Harold. Coins of the Roman Empire in the British Museum II, III and IV, British Museum, 1936-40. Mattingly, Harold, et al. The Roman Imperial Coinage (RIC) II, III, IV, V, VI, Spink & Son. Sear, David. Roman Coins and Their Values II, Spink & Son, 2002. Sear, David. Roman Coins and Their Values, 4th ed, Seaby, 1988. Antoninianus – the large silver coin that replaced the denarius. By the time of Postumus the silver content was extremely low. This article has appeared in Australian Coin & Banknote Magazine.